Express and share your emotions for healing and transformation. When we are able to decipher our emotional state, then express and share the feelings with others, it helps us to heal from them. Whether we speak or write, both are very healing. Our emotions are linked to water, which is also linked to our intuition. The emotions are a message to us from our intuition. Plus, as we express them to heal, we create self-transformation, strengthening our intuition. Our intuition comes from our souls, our inner guidance. The stronger our intuition, the more we can follow our inner guidance, doing what is necessary to awaken and enlighten ourselves, making space within for the Divine miracles awaiting us. Choosing to express the emotions brings us to a more balanced, centered and healthy place in mind, body & soul, bringing us a wholeness of being. When in a state of whole wellness, the Universe or Spirit, blesses us in the most amazing ways, fulfilling our dreams, as well as, showering us with more than we could have imagined. It opens us to the beautiful unconditional Divine Love, anchoring it into our Beings as humans. The more we open our hearts to share our complete selves, the more unconditional self-Love and Love for others increases. Going within to those deep, darker emotions we carry to examine allows us to recognize where we are wounded in some fashion. Once we determine where this is, and can share it with another, we can focus more fully on the positive aspects of ourselves and each other. It helps end the blaming of others for our feelings as they are no longer triggering something within us. Whether we are being hurt or it’s fueling our frustrations or angers,. when we are triggered in this way, it is our own shadow self we are seeing in that person. We may transfer that energy onto that person as we either are not ready to see it, or are not aware of it. We think it’s another person’s fault that we are upset, when in actuality we are hiding the fact that it hit a target within us we do not like in ourselves. These triggers are excellent clues showing us where to look within to find and feel the buried emotions, release them and express them to our loved ones. It is no longer using our fears, vulnerabilities and scars as an excuse to not being present in a situation or relationship, but owning them and then using them to heal ourselves by releasing them. This is the deep emotional work we can do to become a brighter, move Loving and Joyful person, as we heal from the past. Sharing with another, especially one you truly love, brings you both closer together so you can support each other while healing yourself. When both people in a couple choose to consciously work on any issues which arise in a loving and supporting manner, the amount of growth and love experienced strengthens exponentially. Each person feels safer and more secure in themselves, and thus the relationship. It creates a sanctuary which is balanced and harmonious. By expressing ourselves to heal and and transform, we also heal each other. It may not always be easy, but it is always worth it, all ways. Love me until I’m lovable again. We all tend to not be lovable at times. We have our challenges, stresses and fears to deal with during our life. At those times, we may not be the best version of ourselves. Others may find us different or changed, but essentially we are still the same. We are going through a time of intense transformation. We are going to make it through to become a better version of ourselves, as long as we are aware of what is happening to us and work to do something about it. It’s what life is all about ~ Learning and Growing. Some times we won’t recognize it immediately, sometimes we will, but it is important to remember our emotions and reactions are a clue to what needs to be worked on and healed. Those who are closest to us may or may not even notice what we are going through, yet it is important for each of us to know everyone has ups and downs in life, when we are not exactly being the positive, loving, light-filled being we actually are at our core. If others are not noticing your troubles, or becoming upset with you, they may only be seeing themselves in you and reacting negatively. Remember, we mirror each other, and our closest relationships provide the biggest mirrors. What we dislike in others may very well be something within ourselves we need to address, as it hits a nerve, which is why we may become defensive, angry or frustrated. Either way, it’s important to be aware to recognize and accept that everyone experiences good times and challenging times. These times may last a short time, or they may last longer, perhaps for months. The person dealing with a challenge also may not even be aware of it, as they are hiding it so well from others, they are also hiding it from themselves. Continue to support and love them anyway, as it is at these times, when we all need love the most. You saw the good within them at one time, and seeing their shadow self is an excellent clue they are having issues with something within themselves. Remember the good, positive and loving qualities you do love in that person to help support and love them through their troubling times. Know that most anything else is only temporary, detaching from the emotional distress to keep being patient and compassionate. I recently had this situation where I seemingly “changed” and others didn’t understand me or realize I was having a very tough time. I was carrying the world on my shoulders, and that’s a heavy weight to bear. I didn’t want anyone to be affected by my stress and worry, so I kept it to myself. Well, the more I kept it to myself, the worse it became, and I was keeping more and more to myself and not sharing or being open and loving. I had never experienced something like it in my life before and was completely overwhelmed. A new learning experience had presented itself. However, before I was fully conscious of this issues within me, it caused a divide in a relationship I never intended to happen. I re-learned more profoundly, we all need to share our woes, stresses, fears and anxieties. We are all human and we all have them. We all at times end up having the ego lead us, versus allowing our souls to lead us. When the ego shows up as the lead, it creates more havoc in our difficulties, creating even more issues. The ego is about fear and lack, where the soul is about abundance and Love. Over the past couple of months I have done much healing work on myself through Reiki, meditation and more. I am learning, growing and having an intense time of transformation, evolving to a better version of myself. I am releasing the worry, stress, fear and anxiety I was carrying, coming back into my true core of trust and faith in All through Love & Light. Being supportive of someone who is experiencing a very trying time entails patience, understanding and compassion. It is about showing even more kindness to help the other person find their way back to themselves. It includes realizing what that person is dealing with has more to do with them, than you. In this way, we can detach from our reactions, and simply send Love energy from our hearts and souls. Being supportive may include letting the person know you see a change in them and asking if they are okay or would like to talk about, or whether they need time to deal with it alone. But always let them know you love them and will be there when they need it. Being aware of others in this manner and working through them together can have profound healing affects on both you and the other person, whether you are the one having a difficult time or with someone who is dealing with difficult challenges. It allows growth in each person and growth in the relationship, helping each person understand better how to support each other the next time around. Because there are always more ups and downs in our lives. Remember, others in your life will experience difficult times, some more difficult than others, some lasting longer than others. We all experience hard situations in life as lessons to grow and transform, while gaining wisdom to apply to new circumstances. Continue to love those in your life to support them through both the good times and the challenging ones. We all need to be loved until we are lovable again. Those who support you through extremely difficult emotional or mental times by continuing to love you through it are the ones who completely accept you unconditionally. They are the ones who still see your beauty and loving light. They are the ones who are understanding and compassionate. They are the ones who will love you until you are you again. If you wish to follow my blog, you will be included in the next monthly group Reiki energy session, given on the 1st of the following month. You only need to intend to be included to receive the energy when you are ready. The energy will then flow to you, helping you in any way you currently to awaken a more brilliant version of you. 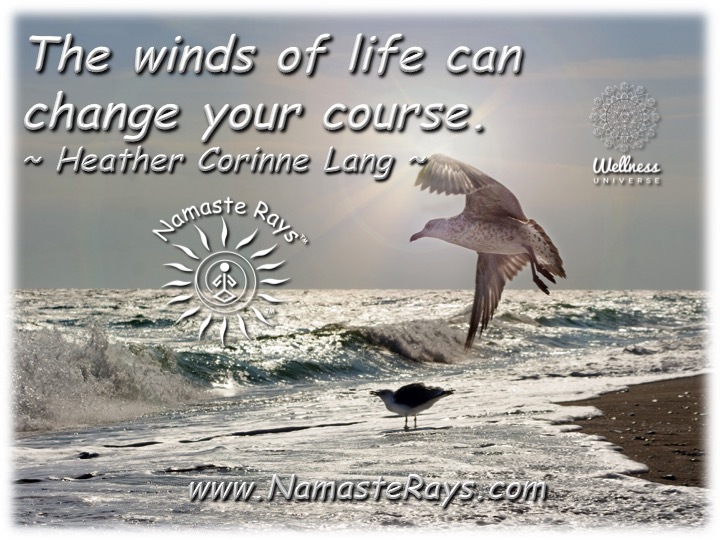 The winds of life can change your course. As we move through life, a wave of energy can come in and change our course. We may be too inwardly focused, not paying attention to those around us, not recognizing what’s changing or any myriad of possibilities. We can be moving along towards what we thought was best or what we thought was going to happen, and any number of possibilities. While we are busy, we can get smacked with a life changing event to gain our attention, since our focus was elsewhere. When this happens, it is time to release, heal and recognize you have just been given a fresh start, new beginning or opening just for you. Divine timing can be working with the Divine, and at times, it can also be a total blindside, which wasn’t expected. These seemingly “out of the blue” happenings are the energy working in your favor. It is your Divine counsel, soul and the Universe helping to redirect you in the direction you have been traveling by working on yourself, transforming and healing past issues. Or it could be because you aren’t doing any work on yourself. It is the Divine supporting and guiding you, even if it doesn’t feel that way at the time. It is actually helping you, by clearing out certain aspects of your life, because something even better needs to come into your life. This can be relationships, jobs, homes and more. Just know that when a wave of energy comes in to change your course, do not use resistance, simply relax and be in the flow, trusting it’s in your highest good. At these times, we need to go within and discover & accept what is happening to and within us, while working on ourselves. When we go against the flow or direction our souls are directing us, we experience tension & resistance bringing on anxiety, worry, stress and more. We are fighting the natural course of energies in our lives. We are at a complete standstill, because the more we push to keep our lives the same, the more the energy pushes us the other way. When we feel this resistance, the best thing we can do is stop and become more aware of why we are having these feelings. We can investigate them, without judging ourselves, to understand them. We can ask ourselves a multitude of questions to help us with the answers for our best interests. We can use other tools such as intuitive guidance or life coaches, Tarot/Oracle cards, astrology, Reiki or other energy exchanges, Akashic Record readings and more. We can work through what has been keeping us stuck in our lives to release it and heal from it, thus awakening a new aspect and transforming our whole Being, healing wounds and completing ourselves. These are what challenges and the winds of change are assisting us to do. We are meant to flow with our soul’s mission, purpose and Divine gifts. We have already intended to live this life, from balancing or releasing Karma, soul contracts, past life vows & oaths and more. When we take the necessary steps to do all of these things, beautiful blessings are bestowed upon us. Miracles happen. Our dreams, wishes and desires start to manifest. We recognize the blockages in life are ourselves and what we continue to carry as baggage from the past or our past lives, which is causing disruption in our current lives. All these indicators and messages is your internal Divine guidance system leading you to the bounty awaiting you. And, this bounty, this abundance, will be even greater than you can imagine. And be grateful for these challenges, large or small, because the Divine wants you to live your best life, wants you to thrive and wants you to find your bliss… and Divine knows best. If you would like assistance and are ready to do the work in your life’s challenges, I’d be honored to help you, help yourself. 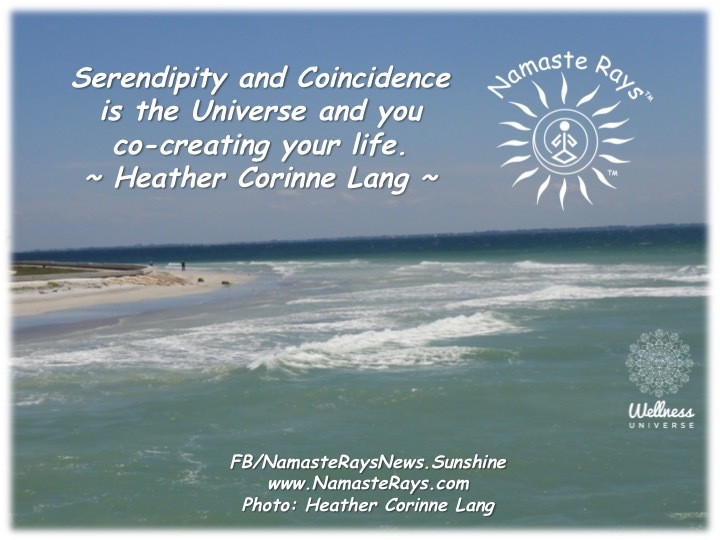 Serendipity and Coincidence is the Universe and you co-creating your life. As our minds wonder and wander about who we truly are and what we truly need to be doing in our lives, the Universe brings us messages. The wondering and wandering is thought energy we are sending out into the Universe (Spirit, God, The Source, Higher Power, or whatever you choose to believe and call it. ), and the Universal energy is responding back to you. This thought energy can also be prayer or wishing or dreaming about our desired life. The run-ins with old friends or people which feel like a total coincidence, is the Universe creating opportunities for us based on what we are working on and working towards from our energy. Or we may receive job offers if we are thinking we need to change our job in some way. It is important to be both specific about what you do wish to create in your life, while being very open to possibilities which may actually be better for you. Simply being aware of each situation or person and what it offers brings you even more of them. Choosing wisely, with discernment, while using our intuition, will help us decide whether the opportunity aligns with our wishes, prayers and desires. All these opportunities are also little nudges to help us learn, heal and grow. Serendipity is another way messages are sent to us, answering prayers, guiding us to our dreams and helping provide us the information we need. This is part of how we co-create with others and the Universe. Everything is pure energy, and whatever we send out, comes back to us. Therefore, it is important to send out positive thoughts, prayers & wishes. It is also important to be detailed, yet open to something even better the Universe is sending to you. For instance, if you want a new job, create the entire scenario in your mind of what you would like in this new job from helpful, kind co-workers to the times you work to the places you work and so on. Being vague will bring you many opportunities, but many of those may not include everything you would truly desire. This co-creation can be taken further into manifestation. In manifestation we are conscious of the energies around us, and work with them in a myriad of ways. Astrology, Feng Shui, Reiki, Tarot, crystals, ceremony and more are tools and ways to work with the energy in co-creation and manifestation. It’s all about what works best for each of us, and resonates highly within us. Using the energies and the tools, such as Reiki Energy or Astrology, can help lead us in the proper direction of our soul journey, providing us insight into the gifts & talents we are meant to use, give & share. Therefore, in life, look for all the coincidences and serendipity occurrences, then observe your reactions, thoughts, and feelings. This will help you understand whether you need to learn something or follow it to another place, space or person for even more understanding, awakening and transforming. Using these clues, messages and nudges can help you both make wise decisions and traverse the best path for you while the Universe works on sending you the best of everything you desire in your life. THE WELLNESS UNIVERSE FREE WEBINAR OFFER!! Use the code below for a free seat to Career v Calling as My Gift to you to start 2016 on a positive note for self-growth and a healthy self belief mindset! The owners of this excellent website, Anna & Shari, offer an incredible uplifting webinar. I’m also on it towards the end with a few other members. Note, this free code expires 1/5 /2016! MORE Wonderful WEBINARS! There are also two webinars for New Year’s Eve & New Year’s Day I highly recommend below. I’m signed up for both! They will be recorded if you cannot attend live. Both Robert Clancy and Christaria are very inspiring and gifted! Check them both out and start your New Year’s off with positivity and wellness!